Best Budget Hotels Less Than $100 a Night! Looking for cheap hotels in St Petersburg Russia? If so, choose from our recommended budget hotels, and enjoy a comfortable stay without sacrificing location. Accommodation in St Petersburg doesn't come cheap, but finding comfortable and Cheap Hotels in St Petersburg Russia are not as hard to find as you might think... if you know where to look. 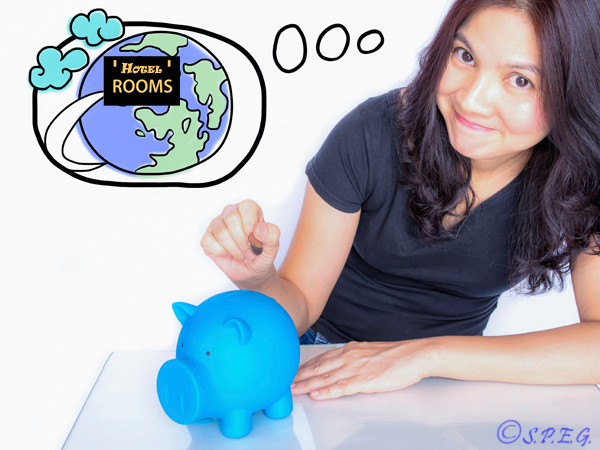 A Woman Thinking About Her Hotel Room Holiday with Piggy Bank. According to data from the Committee for Tourism and Hotel development, the average price for a good cheap hotel room in the heart of the city is 2400Rubles, about $40 per night. With this money you can find a clean and comfortable hotel with all the basics covered, and enjoy easy access to the top attractions, cafes, or restaurants nearby. If you desire a little comfort without giving up the convenience of a central St Petersburg location, here you can find a selection of good-value cheap hotels in St Petersburg Russia that deliver good, basic accommodation — sometimes with a few extra touches — to help keep your travel budget in control. See below our list of top-rated cheap hotels in St Petersburg Russia to find a nice place to stay during your visit. Get inspired, compare prices, and save by booking on-line. "Cozy Mini-Hotel with Bed & Breakfast Feel". Hotel Nouvelle Europe is one of the top-rated cheap hotels in St Petersburg Russia, so a great choice for travelers seeking budget accommodations that are clean, comfortable and a convenient walk to Nevsky Prospekt, the metro, shops, restaurants, banks and famous attractions in the city. This mini-hotel has a bed & breakfast atmosphere with eight rooms, most with shared bathrooms and one with a wonderful balcony that is highly recommended. Located at the corner of 23/6 Mayakovskogo/Baskov in a building that's reminiscent of a residential apartment, it's a little tricky to find, but once inside, guests will discover a warm and friendly reception, charming dining area with inclusive breakfast and a nicely-appointed room that encourages a relaxing stay. Nearby Places of Interests: Russian Museum, Kazan Cathedral, Fontanka River. Amenities: Credit Cards, Air Conditioning, No smoking rooms, Free WiFi, City view, Parking available on site. Guests Love it Because... Centrally located - around 15 min walk from Nevsky Prospekt, There are many restaurants and cafes nearby, Clean hotel and nicely renovated despite being located in a very old building, Friendly and helpful staff, Affordable price, Very classy and personable hotel, Good size rooms, Comfortable beds, Best value hotel for money. A Few Guests Says... A little noisy with traffic, breakfast could be better. Room Tips: Stay in corner room with a balcony. A bit more expensive but it is worth it. "Great Place to Share Amenities and Good Times". Among our list of cheap hotels in St Petersburg Russia there is also Stasov Hotel a classic hotel constructed by St. Petersburg's famous architect Vasili Petrovich Stasov. Centrally located on Basil Island near Nevsky Prospekt, Admiralty, the Palace Square and the Hermitage, visitors find the nearby bus stop provides super convenient transportation. Economy rates, clean, spacious rooms with modern shared baths, a fully-stocked shared kitchen, small 24-hour grocery store next door and a common living room create an atmosphere that feels like a large apartment where friends and family can hang out and enjoy the good times. The staff receives excellent reviews for being wonderfully polite and helpful, making this a great choice for the budget-conscious traveler. Amenities: Credit Cards, No smoking rooms, Free WiFi, Free parking, Family rooms. Guests Love it Because... Centrally located and reasonably priced hotel in the heart of St. Petersburg on Vasilievsky Island, Friendly and helpful staff, Clean and cozy rooms, Shared bathroom on the floor and shared kitchen with fridge and plates and all you need, Close to the main tourist attractions, Common living room to chill out, Spit of Vasilyevsky Island is a 15-minute walk away. A Few Guests Says... A little noisy because of the road, Rooms are a bit small but comfortable. Room Tips: Don't hesitate to take any room at Roses Hotel. "Secluded Gem in a Charming Courtyard". Anabel at Nevsky 88 is not visible from St. Petersburg's bustling Nevsky Prospekt, as it's tucked behind buildings and accessible by a small alleyway that leads to a charming courtyard. From this secluded location, guests have quick, convenient access to everything, with only a minute's walk to the Metro, ten minutes to the Moscow Railway Station and just moments to landmarks, theatres, restaurants and bars. The hotel offers spotlessly clean, well-appointed contemporary rooms overlooking the courtyard, fully-equipped kitchens on each floor and a personable staff ready to assist with transportation, tours, tickets and local events. Surely one of the most central cheap hotels in St Petersburg Russia, so a really great value for a small amount of money. Amenities: Credit Cards, No smoking rooms, Air Conditioning, Free WiFi, Free parking, Family rooms. Guests Love it Because... Top location, The rooms are small but well appointed and contemporary, Comfortable beds, The hotel staff is pleasant and helpful, Internet is good, Clean and cozy hotel, Reasonable prices, Excellent atmosphere, Best value central hotel for money. A Few Guests Says... Breakfast options for vegetarian and coffee options were not good, Deep escalators, Slightly noisy courtyard but nothing you couldn't live with. Room Tips: Single rooms are very small. If you are a single traveler and choose this hotel, treat yourself with a double room. "Economy Rates in Spacious European Style". Set in a quaint building on Vosstaniya Street right off Nevsky Prospekt near the Metro, the Moscow Railway Station, the Galleria Shopping Center and attractions of St. Petersburg, Roses Hotel offers a variety of comfortable rooms in modern, European style. The building's entry has a staircase that leads to the 3rd floor reception and a welcoming staff. There is no elevator, but a bellhop assists with luggage to all floors. Some rooms have a balcony, others have a kitchenette and some have a combination shower and spa bathtub. All rooms are spacious, clean and exceptionally quiet. Guests will find this a pleasant stay on a low budget in the heart of St. Petersburg. Nearby Places of Interests: Moskovskiy Train Station and the famous Nevsky Prospect. Amenities: Credit Cards, No smoking rooms, Air Conditioning, Free WiFi, Guarded parking, Child Friendly, Family rooms. Guests Love it Because... Great location, Just few minutes walk to Nevsky and Metro station, Friendly and helpful staff, The rooms are clean and in fair size, Breakfast is fresh and tea/coffee are available 24 hours as well as free WiFi, They change towels, Bedding every day, Good value for money. A Few Guests Says... This hotel would be perfect if you add a lift, Breakfast is simple but will fill your stomach. "Cozy Bed & Breakfast Surrounded by Great Eats". Enjoy a cozy, home-like setting at Adagio B&B on Zhukovskogo, located near Vosstaniya Street in a vibrant section of St. Petersburg filled with shops, cafes, restaurants and bars. Close to famous cultural attractions, the Metro and Moscow Railway Station, this converted 4th floor apartment has four clean, comfy rooms, a shared bathroom and a shared kitchen with self-cook breakfast provided. There's no elevator in the building, but there is internet service, a shared washing machine and drying racks in each room. The manager receives glowing compliments and guests say the great low rate, courteous service, well-kept accommodations and warm, hospitable atmosphere simply can't be beaten. Definitely one of the coziest cheap hotels in St Petersburg Russia! Amenities: Credit Cards, No smoking rooms, Free WiFi, Terrace, Pet friendly, Family rooms, Shared kitchen. Guests Love it Because... Great location, Rooms and shared facilities are clean and well kept, Linens and towels are provided, Basic breakfast, Friendly and helpful staff, Nice atmosphere, Comfortable and quiet B&B well located, 15 minutes walking distance to Nevsky Prospekt and a few minutes to Moskovsky train station. A Few Guests Says... The apartment is on the 4th floor and there is no lift in the building. Small breakfast (it contains only bread, coffee, tea and porridge). If so, try searching for different cheap hotels in St Petersburg Russia on Booking.com. Read reviews from different travelers, and find the best price online.